Sony announced a pile of new digital cameras yesterday. I was quite pleased to hear about them, despite the fact that I have no immediate plans to buy one. 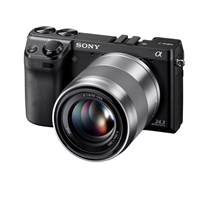 As I’ve shared here, I’m very happy with my Sony NEX-5 compact interchangeable lens camera. I like having a cam that’s the size of an advanced point-and-shoot, but with a dSLR-sized sensor that delivers better overall quality, and much better low light performance without a flash. Sony announced a high-end NEX camera, a “prosumer” version if you will, called the NEX-7. I must admit that I do have a little bit of camera lust because it sports a very high resolution 25 megapixel sensor, along with an actual electronic viewfinder, inside a body a little bit bigger than my NEX-5. However, I don’t really know what I’d do with 25 megapixels, since that kind of resolution is mostly useful for very large prints, which I don’t make. More importantly, I just don’t need a new camera, and I’m resistant to the perpetual upgrade mentality that our contemporary consumer electronics culture perpetuates. Not a single thing about my NEX-5 has changed since Tuesday, the day before the NEX-7 was announced. Like all tools, there are little niggles that bug me about the NEX-5 that might be better on the NEX-7. But I honestly can’t think of one concrete way in which my photography would improve if I only replaced my NEX-5 with the NEX-7. There’s a oft-repeated adage in photography that “it’s the photographer, not the camera.” (Or as photography blogger & gadfly Ken Rockwell puts it, “it’s not about your camera.”) In general terms, I most certainly agree. An experienced photographer knows a camera well enough to know how to get the picture he needs from it. Many great cameras have been used to take crappy, or just mundane, photos. An experienced photographer also knows when a particular tool is not right for the job. But this caveat has more to do with significant differences than minor upgrades. For instance, a 110 film camera is likely an inferior choice to shoot a photo for a billboard as compared to a medium-format camera with a much larger negative. That’s a fairly extreme example, but the idea should be clear. Looking at the NEX-7, even though there seem to be operational improvements–like the addition of two customizable control dials–that may make it easier to control the camera, I can’t say that will necessarily result in better photographs than what I’m taking now. Just because I might want it doesn’t necessarily mean I need it, or that it will even be that much of a real improvement in my actual photography. My photography will improve more if I just go out and thoughtfully shoot more photos than if I save up for or buy a new camera instead. So then, why do I care about the NEX-7? Frankly, I’m glad to know that Sony seems to be committed to further developing the NEX line of cameras. Along with the 7 Sony also announced three new E-mount lenses that fit the NEXes. Despite the fact that many photographers upgrade cameras with every change of season, for me a digital camera is not an insignificant purchase. I like a camera body to last me years, not months. Therefore I would prefer not to feel like someone who purchased a brand new $500 HP Touchpad a month ago, only to see the whole product line now discontinued and clearance priced at 99 bucks. Even if Sony did abandon the NEX line it wouldn’t be the end of the world. My camera and lenses would still work, and I don’t really need to buy that many more lenses or accessories. Nevertheless, I am glad to know that there’s a good chance that in five years or more Sony will have an up-to-date NEX model camera available should I need to replace mine or upgrade. I will continue shooting with my NEX-5, feeling just a little more secure that my favorite little camera isn’t an orphan. Speaking of my NEX-5, I recently purchased a cheap and fun little lens that easily adapts to the NEX, and that won’t work with a bigger dSLR. That will be the subject of my next photography post.